Pretty slick race shirt. Got a pint glass instead of a finisher medal – I’m not sure how I feel about that, finisher medals are actually a little more useful to me than additional glassware, but it’s something. The Jay Lyons 5k is now in its 18th year – a memorial race for one of six Worcester Fire Fighters who died fighting a warehouse fire in 1999. If there is a race worth running, certainly it is this one. I have to say I wasn’t quite sure how this was going to go. It was a gamble and one I may have lost had I gone for that additional lap yesterday. The day started much later than usual – even for a weekend day – and when I did actually get up, I had a hard time actually walking around. I was pretty much 90-years old all morning. After 3-laps at FIT last year, I couldn’t walk for a week. I mean I really hammered myself good. This year, while sore, I’m self ambulating so that’s a good sign. I may not have been with an additional 3 miles and 1400′ of gain, so I may have learned a lesson. So, today was pretty much lazy – I did some laundry, did some errands, but otherwise laid pretty low. According to my Fitbit, by noon I had accumulated maybe 1,800 steps, when I’ve been averaging about 20,000 daily. By the time I had my bib, and the National Anthem began playing, I still wasn’t sure how well I was going to be able to run: the ibuprofen started to wear off and I was very much feeling the dents and dings from yesterday’s course. Repping Team Sneakerama. Something about running with this team brings out my better efforts. The fire truck horn sounded and the runners were off. My first mile was pretty good, but it was clear to me that it was going to be a bit of a battle and that first mile was definitely going to be my best: a 7:20 pace. Mile 2 was reasonable, but clearly slower at a 7:40 pace. I was feeling the wear and tear by that point and when my watch went off with the 8:04 pace for mile 3, I knew I had only a little more course left and with what gas was left in my tank, I laid it out there. The course was really, really flat and a little more than a 5k – I recorded 3.18 miles, and in that time I hit a 6:41 pace. Now, I’m left to wonder if I could have pulled off a better pace had I paid more attention to my mile 3 time although I’m quite sure it would have had the opposite effect. It’s a nice, pretty easy course, that I think I would normally have had a good shot at a personal record. Even still, it wasn’t a bad time at all – a friend noted that a few months ago that would have been close to a personal record, and indeed that is true. I’m happy with the overall result and glad I took the opportunity to run. Team Sneakerama took home quite a few individual trophies and a team award – I have to say for a relatively small race, funding a great scholarship for one of Worcester’s High Schools, there were a HUGE number of awards. I’m just going to say it: today was not going to be a great race day for me regardless. It was perfect weather, if a touch cold. There was a bit of a headwind for the first mile and for the last .2 mile, but that wasn’t it. 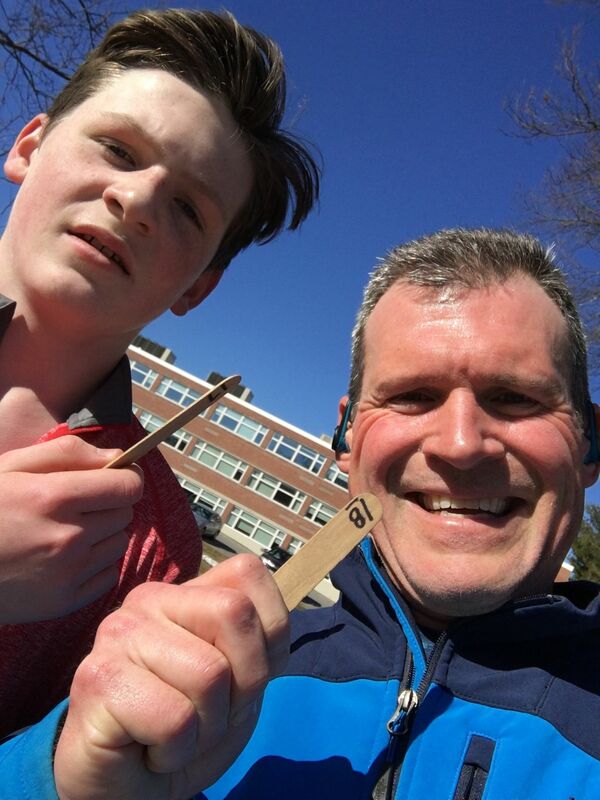 I haven’t felt quite right since last weeks’ trail race – a few dings, and dents – and I promised my boy that I would run with him today. Today was basically going to be some time on my feet with my boy, nursing some sore parts. He really doesn’t dig selfies. And so it was. My watch recorded a 9:11 pace: the first mile was respectable enough, but at about 1.5 miles I realized I had gotten a little far ahead and one of my running club friends on his way by – because, that’s his MO – said something about me throwing the kid under the bus, so I realized I needed to do a better job of running with him. I played cat and mouse for the rest of the race, and for the last stretch I waited for him – even giving up a finishing position!! – and we sprinted to the finish. Officially we finished 17 and 18. I’ll take that experience with him over running my best. I like small races because it allows me to say I had a “top 10 finish” despite being slow and paunchy. As it happens this was also Week 9 of the 2018 52-Week race. Over the last, we’ll say 30 hours, the weather has been a touch sketchy. A Nor’easter blew through the area beginning yesterday, with threats of upward of 12″ of snow for Central Massachusetts. Winds whipped around all day yesterday, knocking out power lines, downing trees and on the coast high tides flooded significant swaths. For all the threatened fury, however, Central Massachusetts received some decent winds, but a mere dusting of snow. By 8:00 AM, it was perhaps 37-38 degrees, a stiff breeze blowing on occasion, and cloudy as though more rain threatened. Just the kind of day where I look around, look up, and wonder if I really want to run this race. Chilly, but not cold. Gray, but not dark. About as middling as you can get. Even as I showed up at Worcester State, I wasn’t sure if I was going to run or if I was just going to hang out and volunteer: after all, I do have a bit of a race coming up tomorrow and I’m not entire sure I’m ready for it. As I walked in the room, the lone Central Mass Striders (CMS) volunteer greeted me, and wrote my name down. Whelp, I’m registered. I guess that means I’m racing today. I was a little concerned because I woke up a little stiff this morning, so I went and did a warm up mile to shake out the cobwebs and that helped a lot. It was surprisingly fast; I thought I was moving far slower than I actually turned out to be moving, more stutter steps than outright strides, but it felt good. Today’s race was Counter Clockwise, so that meant rather than finish at the Aristotle statue, we start there. The first couple of miles felt pretty good. Not only was I moving at an historically fast pace for me, I maintained it pretty well through those first two miles. Of course, “pretty well” is a relative expression – there’s an 8-second pace difference between the two miles, but for me to maintain that sub-8 minute pace for 2-miles it’s a personal victory. Mile 3 is the one that ALWAYS gives me fits because it’s uphill and it was especially difficult today with the headwind blowing from the remnants of the storm. Again, I found myself traipsing up part of the hill because I’d burned so much fuel trying to maintain the pace on the first two miles. I’m going to have to get more mentally strong there because I know I missed a sub-24 minute race because of it…or at the very least gave up a shot at a personal record on that course because of it. Overall, I finished with a 24:30 time – historically a great time for me so I can’t be too upset with myself, but I am upset in as much as I could’ve been faster and I hate that I settled for less.